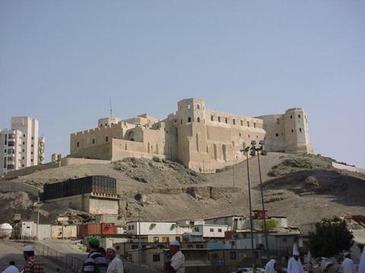 The Ajyad Fortress (Turkish: Ecyad Kalesi; Arabic: قلعة أجياد‎) was an Ottoman citadel which stood on a hill overlooking the Grand Mosque of Mecca, in what is now Saudi Arabia. Built in the late 18th century, it was demolished by the Saudi government in 2002 for commercial development of the Mecca Royal Hotel Clock Tower, sparking global outcry. The Ajyad Fortress in the background of the Kaaba, in 1889. The destruction of the historic structure stirred both domestic and international protest. The Turkish Foreign Minister İsmail Cem İpekçi and as well as several institutions tried to prevent the demolition. The Turkish Democratic Left Party (DSP) Deputy Ertuğrul Kumcuoğlu even suggested a boycott on travelling to Saudi Arabia. The Turkish Ministry of Culture and Tourism condemned the obliteration of the fortress, comparing the act to the destruction of the Buddhas of Bamyan, and accusing the Saudi authorities of "continuing with their policy of demolishing Ottoman heritages." The French news agency Agence France-Presse (AFP) quoted Saudi Islamic affairs Minister Saleh al-Shaikh as saying "no-one has the right to interfere in what comes under the state's authority". In reference to the housing component of the plan, al-Sheikh added that it was intended to house pilgrims to Mecca, and said "this is in the interest of Muslims all over the world". King Fahd has given his approval for the King Abdul Aziz Endowment for the Holy Haram and for the preparation of the project site by removing the hill and the castle. The king instructed that the castle should be preserved in full by rebuilding it," the minister said in a statement. A 1/25 scale model of the fortress is included along with other architectural models at the Miniatürk miniature park in Istanbul, Turkey. ^ Simon Wheelan (28 January 2002). "Saudi government demolishes historic Ottoman castle - World Socialist Web Site". Retrieved 20 January 2015. ^ "BBC News - MIDDLE EAST - Saudis hit back over Mecca castle". Retrieved 20 January 2015. ^ "Saudis hit back over Mecca castle". BBC. ^ "Revealed: The world's 20 most expensive buildings". The Telegraph. Archived from the original on 28 July 2018. Retrieved 28 July 2018. of Abraj Al Bait Towers. ^ Gossett, Sherrie. "Mecca Conference Criticized for Hypocrisy on Holy Site Destruction". crosswalk.com. Archived from the original on 18 May 2008. Retrieved 9 April 2008. ^ "Ecyad Castle". Retrieved 20 January 2015. ^ Wheelan, Simon (28 January 2002). "Saudi government demolishes historic Ottoman castle". World Socialist Web Site. Archived from the original on 10 May 2008. Retrieved 2 April 2008. ^ "Holy site expansion to preserve historic Ajyad Fort". Royal Embassy of Saudi Arabia at Washington D.C. Website. 9 January 2002. Archived from the original on 31 October 2005. Retrieved 2008-04-09.